WASHINGTON--(BUSINESS WIRE)--SubscriberWise (www.subscriberwise.com), the nation’s largest issuing CRA for the communications industry and the leading provider of big data, advanced-analytics, and business-rules technology, announced today that company founder and child protector David Howe traveled to the Office of United States Senator Marco Rubio to discuss the crime and circumstances surrounding the National Car Rental attempted theft last October at the SW Florida Fort Myers International Airport. Howe was advised by senior investigators from the Florida Attorney General’s office, including Director Victoria Butler, to take any legislative concerns to state and federal elected officials (http://www.businesswire.com/news/home/20170303005471/en/National-Car-Rental-Crime-Victim-David-Howe). 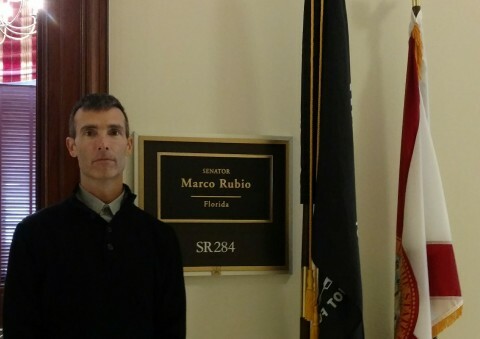 “Yesterday I was in Washington, D.C. at the Office of United States Senator Marco Rubio,” stated David Howe, National Car Rental fraud victim and America’s child guardian. “The meeting in Senator Rubio’s Washington district office was an honor and a privilege to say the least. “Yes, even an honor and privilege for the world’s Credit Czar,” Howe humbly stated. National Car Rental fraud victim and survivor David E. Howe asks U.S. Senator Marco Rubio for federal protections during presentation at the Russell Senate Office Building, Washington, D.C.